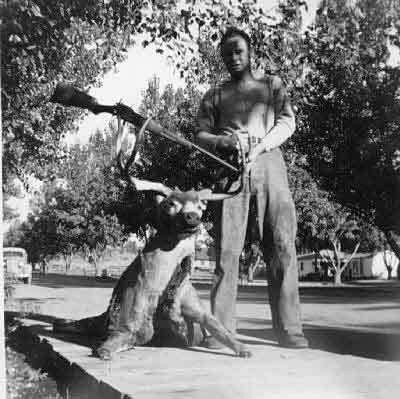 Curtis Heuson took big mule deer buck near Susanville, California in 1937. My mother was pregnant with my sister and it was the first day of deer season. My dad, Curtis Heuson, had stayed home from hunting camp with all the guys because he didn't want to be gone when my mother's time came to give birth. My mom decided that day was not "the day" and told my dad that he should go hunting. Dad went hunting on Diamond Mountain, which is south of Susanville, California. He hunted up to a big manzanita patch and decided to sit and watch for a while. He was sitting on an outcropping of rock for an hour or so and decided to hunt on. As he stood up, the big buck jumped up in the manzanita  one shot and it was down. After he got to the big buck and field-dressed him, he could hardly move it by himself. After some thought, he drove back into town and got my grandfather to help him get the buck out of the brush field. The buck was never weighed or measured, but was definitely a true trophy. If you look closely at the picture, you can see that the forelegs have been cut. There is a way to cut and skin the forelegs and back legs and make slits in the skin so you can anchor front quarters to hindquarters to make a sling so it is easy to slip your arms through and get the carcass up on your back in order to pack your trophy out. I've done this many times and it works really well. Editor's note: Hunters, it may be hazardous to your health to carry a deer on your back during deer season. Have a picture from the Good Old Days (prior to 1980)? Send it to us via e-mail or snail mail at WesternHunter.com, P.O. Box 7708, Stockton, CA 95267-0708.